The Pentagon has admitted US forces used white phosphorus during the assault last year on Fallujah. A Pentagon spokesman's comments last night appeared to contradict the US ambassador to London who said that American forces did not use white phosphorus as a weapon. The ambassador also claimed that napalm (Mk-77) was not used in the original invasion. 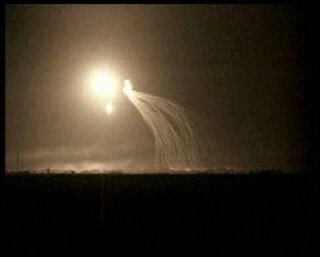 Pentagon spokesman Lieutenant Colonel Barry Venable said that white phosphorus - which is normally used to lay smokescreens - was not covered by international conventions on chemical weapons. But Professor Paul Rodgers of the University of Bradford department of peace studies said it would probably would fall into the category of chemical weapons if it was used directly against people. In a BBC radio interview they first talk with RAI, the Italian news organisation that was largely responsible for bringing the story to a wider audience with their film Falluja: The Hidden Massacre. While the interviewer is slightly confused by the issue of targeting civilians - any deliberate targeting of civilians using any weapon is of course illegal - the interviews also bring out interesting perspectives from Ming Campbell and others. However, this TV interview from Democracy Now and an excerpt from the RAI documentary focuses on the human impact of the story. The full film can also be viewed from the Truth Out site here with Real Player or here using Windows Media Player. Finally, the original US army article that confirms the use of white phosphorus and the attempts of the US government to mislead world opinion can be seen here.